This past weekend I was on “vacation” at a conference in Orlando, Florida. It was an amazing weekend filled with meetings, new friends, famous people, exciting classes, and more. As much fun as this work vacation was, I have to admit I’m worn out! Have you ever gotten back from an amazing trip and walked into your house just exhausted? Give yourself a break. Take an hour to just sit down and chill. Don’t worry about the laundry or getting those bags unpacked. Sit, look around, regroup, enjoy being in your home. You just went on a trip and were away from your own house for a while. Even after a tropical beach vacation, getting home can be a welcome respite. Bring all of your bags inside and unpack quickly. I’ve found the best way to get the dreaded unpacking over with is to do this as fast as possible. Take the bags to the room of where the stuff belongs and put up whatever clothes are clean. Take the toiletries to the bathroom and immediately put away. Take the dirty clothes to the laundry room. And lastly put the suitcase away. Tah dah! One less thing to have to worry about. Have a home-y comfort food meal. Lots of times when I travel, I eat out a bunch or each way too much junk food. It’s just nice to be able to come home and eat a nutritious meal. This also helps with getting a good night’s sleep which leads me to the next tip. Get a good night’s sleep. This past weekend was a lot of fun but it was so much do to in such a short amount of time that each night I had 4-5 hours of sleep. It’s just not enough! Tonight, I’m planning to rest up and rejuvenate for the week ahead. Savor the memories! I took 200+ pictures from my 4 day trip. It’s not actually as many as I usually would when I’m with my kids. Still, I’m loving looking through all the photos of all the new friends I have and all of the things I got to experience. I already have these uploaded to my dropbox. If this had been a family trip, I would make an online photo book to remember it all by. Even though I’ll probably not make a photo book out of my conference photos, I will be savoring the memories from this weekend. 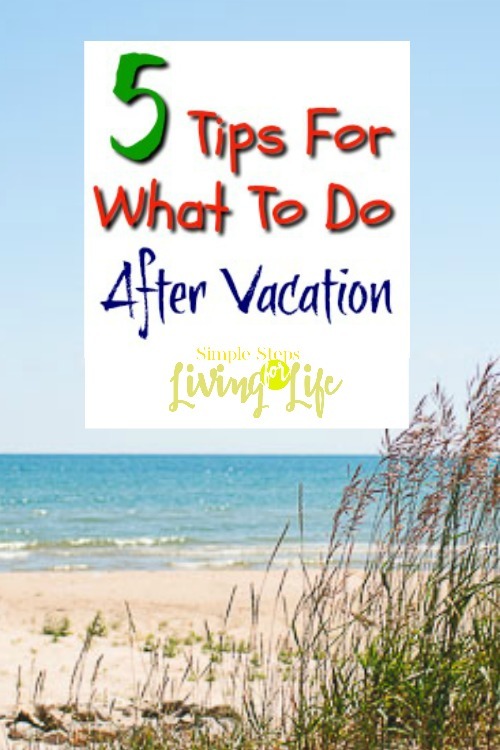 I hope that these 5 tips have been helpful and hope that you enjoy your summer vacations. For more Marvelous Tips Mondays click here!